all it takes is time and money -- Where are we going and why are we in this hand basket? Just watched Msnbc’s 2025…is full of more liberal Gore type brain washing…the end is coming soon crap if we don’t act…..which means massive government intervention…..definite “Cap and Trade” ponzi fraud carbon trading scheme supporters…Brought to you soon by Obummer….and his Chicago mob…….. Lets try this for size. In India I used to ride a small motorcycle that used to run ~15-180 miles a gallon. That was back in 1987. Now they make a 225 FI bike that runs almost 100 mph and 150+ mpg. Lets see a cap and trade or otherwise disincentive to use up a lot of gasoline. I am not saying we need cap and trade, I am just saying we're using up a lot of gas to do the same thing other countries do. OK India is warm and usually slow so we dont need a lot of weather or safety gear, still the US is so anti motorcycle its not even funny. It will be a lot safer for bikers if they took 90% of cars off the road somehow and put bikes there. There needs to be a way to make that happen. No one uses motorcycles to commute. They treat it like some expensive toy. AKA they have too much money and very little sense or taste. Bikes make excellent commute vehicles. If the infrastructure supports are put in place, like cheaper or free parking (afterall it takes 1/10 the space of a car) and other features it woul be so easy on the infrastructure and a lot cheaper for the users too. Pelosi's best talent IMHO is to be available to get her pic taken to help people with target practice. Harry Reid as well. For NC weather in winter especially for the shorter commutes - 25 miles 1 way or less, a joe rocket 2pc suit with the full on armor in it, helmet, gloves and maybe a set of hippo hands and yea a scarf for your neck (just found that yesterday, my neck was freezing till now) works fine for me. No one is going to commute in winter unles sthey have done it for 1-2 years in better weather. It doesn't even matter if you're an experienced rider. To commute in winter, you should ahve commuted 1-2 summers prior. That is it. Commuting isn't riding, it takes a different mind set. You dont get it just being a rider. 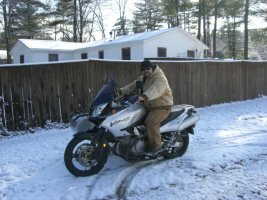 I used to run 85 miles 1 way last winter, ran it on my SV1000, my virago and my Maxim last year. A lot more gear is needed, including heated gloves and jacket. Maybe even pants, I never managed to wire the pants though, jacket and gloves were great. The SV oddly is a much nicer winter commuter than people give a sport bike credit for. You're semi fetal position so you dont have that much wind to freeze you. 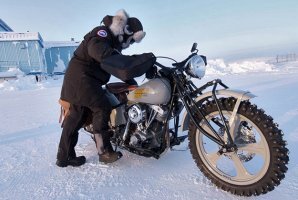 It should have come better equipped for heated stuff, like grips and a bigger electrical system. I had to shut my jacket 5 miles out and keep the revs up or I'd not restart after work. No one uses motorcycles to commute. Not in the US ... or atleast not in the numbers of people that actually own a motorcycle. So many bikes I see in people's garages ... have not moved in years. My 82 xs650 with 8K miles is proof. Most bikes I buy average under 100 miles a year till I get them. Then they shoot up to 5K per year only cos I have 5-6 ... and I dont look for low miles, I buy cheap stuff ... that is my goal. He was just a crazy educated in the finer schools of Europe..
Off the current topic but John yo ukeep bringing up NAFTA. Now Nafta went through in the last 2 years of Clinton's administration. If I recall at that time it was a republican controlled house and senate. further yet, Nafta was designed to break the back of the unions and kill their strangle hold on the manufacturing industry. Very anti democratic agenda. If I remember Clinton also was largely a lame duck without a veto when a bill is ratified with over 60% if I recall. I have to do my research, but NAFTA was a republican creation with a labor president unable to veto it. Somethings I have to check but I believe that is the story of nafta legislation. OK so you're saying NAFTA was not a republican Idea ? Or Dole signed it and broke the tie in favor and of course clinton was nailing fat chicks and too horny to care ... so I guess you're saying it was republican ... OK we need a xsjohn to english dictionary. BTW ... Any time I see Beverly Perdue, I feel like kicking her in the teeth ... one more of those people with faces perfectly suited to be on urinal cakes so you will not miss. I'm saying Clinton signed it and Gore champoined and lied all about it like he does everything else....did you listen to that video..
Just a note in passing---for years I worked in Seattle. I live 60 miles north of the city (thank God!). I bought my 1977"D" specifically to commute to and from work, and did so year-round. I had my first sidecar for winter, and a huge fairing, and it was during that horrible 55mph national speed limit, so the bike wasn't thrashed. It's true that most people revert to cars for the winter, because by the standards of the World (or of our own immediate ancestors) we are spoiled rotten and soft as melted butter. My uber-friend Sonny doesn't commute on his bike--he is retired. He rides for pleasure, and does so in 20-degree weather and wind in Tennessee. It's sad that if Ford made a Model T now, they couldn't sell it. Poor heater, little weather protection---people wouldn't buy it even if a modern engine gave it 150mpg. So blame the government if you want to, but the government we have is pretty much the one we deserve....we voted for those idiot demopublicans. For the record: I love my Country. It's government? Not so much. My bikes? Absolutely! Can\'t log on as Barb, but that\'s still me.....with a shed full of bikes! Fireplace Fascism already starting in California and will be coming to your home soon “CAP and TRADE”…….Liberals will soon be after your fireplace as they try to shove Calif standards across all of Amerika……1400 page bill is in the Senate……..and both houses are loaded with liberals…better watch Lisa Jackson EPA endangerment ruling……also coming soon…..
Bay Area air pollution inspectors found 47 violators burning wood fires illegally during Christmas Day's Spare the Air alert — which was declared because cold, unhealthful air had been forecast. Violators get written warnings for a first offense and $400 fines for a second offense. "We know a lot of people like to burn on this holiday, but it's our duty to protect public health," said Ralph Borrmann, the spokesman. It demonstrates once again that there is no limit to how intrusive and destructive government can become in the name of protecting from real or imaginary public threats to safety and health. Liberal global warming bill (when there is no global warming) the enemy is among us…. Seemingly unnoticed report from the American Petroleum Institute that oil and natural gas drilling activities in the U.S. fell nearly 46 percent in the second quarter from a year ago. A small portion of this change is attributable to a drop in the price of oil, but the elephant in the room is Obama-Waxman-Markey, the cap-and-trade, anti-global warming energy bill that recently passed the House and is now pending in the Senate. Energy companies know that legislation is aimed directly at them and are reducing drilling operations accordingly. Well, as long as we are on California---as of January 1, 2010, in California if you wish to purchase ammuniton, including .22, you have to sign for it, and they check your name against their "list". Also, there is a limit of 250 rounds (I believe) per month. So if you have a couple of kids who like to plink at tin cans, you are totally out of luck. Chip. Chip. One little step at a time.....it's The Brady Bunch, back for another tiny, not really noticed little chip away at the Constitution. No one uses motorcycles to commute. They treat it like some expensive toy. I follow this thread but never comment on it. I live in new england and we are having one hell of a cold winter here Yesterday we had a high of 16deg and last night -8deg! I wish this global warming thing would hurry up and get here in new england By the way I don't own a car anymore and will ride all winter long, yesterday was coldest for me yet at 16deg! Go to the "rounders.com" site and you will find plenty of people not treating there bikes as "expensive toys"